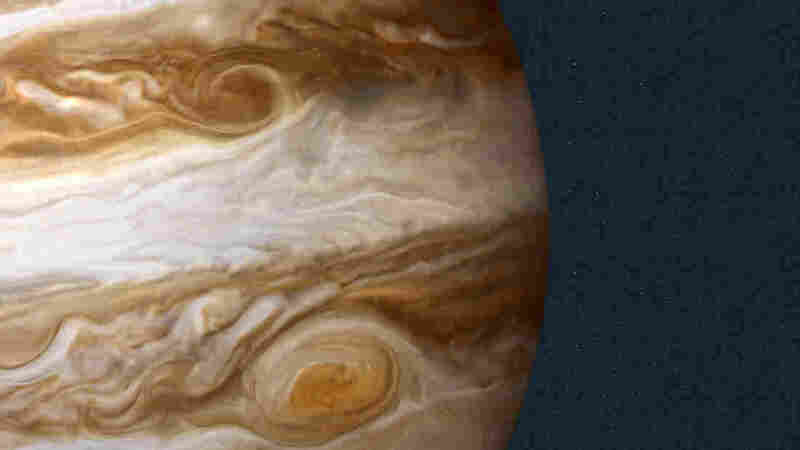 Astronomers Discover 12 New Moons Around Jupiter Astronomers have found 12 more moons orbiting the planet Jupiter. These moons are all small — just 5 kilometers or less across — and one of them behaves very strangely. The planet Jupiter now has a total of 79 identified moons. As part of that search, Sheppard was using the 4-meter Víctor Blanco Telescope in Chile in March of last year and realized that Jupiter was right near the part of the sky he wanted to search. "So we could also search for Jupiter moons while looking for things that are well beyond Pluto," Sheppard says. One thing that helped was the especially large camera attached to the Blanco telescope. "[That camera] allows us to search the whole area around Jupiter in a very few images," he says. They quickly hit the jackpot — 12 new moons appeared in the images. As they reported Tuesday in an online notice from International Astronomical Union, all 12 have now been confirmed by other telescopes. Nine of them are in previously discovered clusters of moons that are in what astronomers call a retrograde orbit. "They're going around the planet in the opposite direction that Jupiter rotates," Sheppard says. 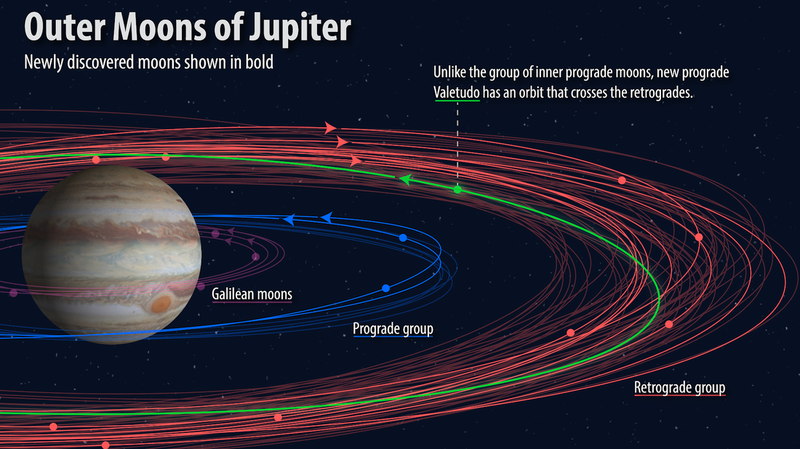 An illustration shows how the orbits of the 12 newly discovered moons (bold) fit into the known orbital groupings of the Jovian moons (not bold). The "oddball" with the proposed name Valetudo orbits in the prograde, but crosses the orbits of the planet's outer retrograde moons. Astronomers think retrograde moons have a different origin story from prograde moons, which travel in the same direction that their planet rotates. Sheppard says Jupiter's prograde moons probably formed from the same spinning disk of stuff that eventually coalesced to form the planet. By contrast, retrograde moons were probably objects that once were wandering around the solar system and got snared by Jupiter's gravity. "They didn't form with Jupiter," he says. "We think Jupiter captured them as these objects got too close to Jupiter in the past." Most of the prograde moons orbit much closer to the planet than the retrograde moons do. But the moon Sheppard and his colleagues call "oddball" is different — instead of orbiting with the other prograde moons, its orbit takes it out as far as the retrograde moons. The oddball is also the smallest of the moons that Sheppard and his colleagues found, just 1 kilometer across. Sheppard thinks it may be all that's left of a larger moon that crashed into one or more of the retrograde moons sometime in the past. Sheppard and his colleagues have proposed naming the oddball moon Valetudo, after a minor goddess and great-granddaughter of the Roman god Jupiter. Even though a dozen new moons is a pretty good haul, Sheppard expects that more searching will turn up even more moons. Maybe 100 or more of the really small ones. And that raises a question: Does an object less than a mile across deserve to be called a moon? Sheppard agrees it's problematic. "Maybe there will have to be a new definition for the smaller moons. Maybe a dwarf moon for anything that's 1 kilometer in size or smaller," he says.